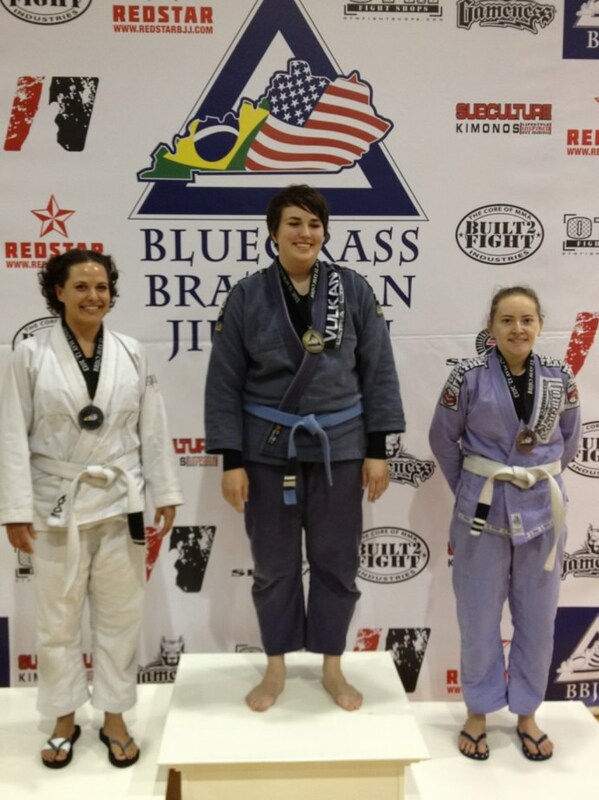 Well I just got home from my first tournament! It was the bluegrass open in Louisville, KY – about a 3 hour drive from my house. Coach wasn’t able to come (had to be in a wedding), and I didn’t know who was going to come. Had a fair amount of jitters! I spotted someone wearing my team shirt so I sat down with him – he was from an affiliate school in Cincinnati. When I saw 3 of our purple belts walk in I instantly relaxed! They had the upper level belts go first (then kids, teens, women, guys). We took one gold, and one silver in the purple division! Yay! I had a jitter moment again, so the guys walked me away from the crowd and reminded me that I do this every day in class. They reminded me of coach’s directions (pull guard, and play spider) and to relax and breathe. By the time my name was called, I skipped up to the table. There were only 8 girls so they divided us up into 2 weight class groups of 4. I weighed in at 141 so I wound up in the group ranging from 135 to (brace yourself) 214. Good thing I’ve been practicing with the boys! Anyhow, got to do the first match of our group. I pulled guard, and played my spider guard. I found my grip wasn’t up to it’s normal snuff and found myself not breathing. Managed to catch myself, breathe, and somewhat relax. I wasn’t able to get a sub, but she spent the whole time trying to pass my guard. We ended in a draw. The guys all patted me on the back, rubbed my hands, and gave me water while I waited for my next match. My directions were to just breathe, stay loose, and not sit down. The guys were impressed – they expected her to walk all over me, but I held my own very well. My final round instructions were to shoot for the omnplata. I told them I’ve never actually landed it live, but they told me to go for it and take the sweep if I miss. I’d watched my last opponent in her previous fights, and she’s a guard puller. So I beat her to the punch and pulled spider again. We had to be moved back to the mat center and after that I snapped into a triangle but couldn’t get the angle. I reguarded and grabbed for my cross choke grips (In retrospect, I should have pulled out my #1 sweep instead). She went for the choke as well so I pulled my knees up into her chest and made space to reposition. Ended up running out of time and it was (another) draw. Thought I was done, but I ended up having one more tie breaker match with the same girl. They gave us a few mins to rest (I got another hand massage!) Then we had at it. Still managed to pull guard. This time I played spider, snapped the triangle, switched to omnoplata, then snapped back into a solid triangle and nailed it. I ended up taking home 3rd place – was pretty happy with myself overall. The guys said I have a solid guard and they’re gonna work with me to get some sweeps down for NAGA next month. One of the guys took video of my matches – he’s gonna get it to me sometime this next week. This warrior needs some rack time! I look very small, but happy!